Florida school psychologists have an upcoming license renewal deadline of November 30, 2017. Failure to renew an active or inactive license by the expiration date will result in the license being placed in delinquent status. Click here for information on how to renew online. Professional Development Resources is approved to sponsor continuing education (CE) by the American Psychological Association (APA), the Florida Office of School Psychology (Provider #50-1635) and is CE Broker compliant (all courses are reported within a few days of completion). 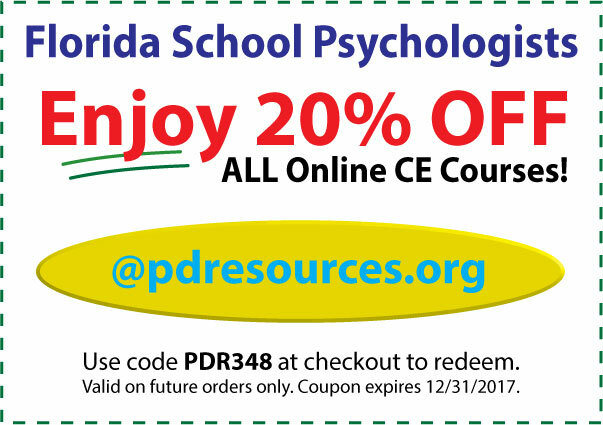 Florida School Psychologists can earn all 30 hours for renewal through online courses offered by Professional Development Resources. Click here to view APA and Florida-board approved online CE courses.